This talk examines how writers of color David Walker (1796-1830) and William Apes (1798-1839) responded not only to Thomas Jefferson's claims about African Americans' and Native Americans' intellectual and creative capacities, but also to a specific edition of Jefferson's Notes--the eighth American edition, published in Boston in 1801. Rereading Walker's and Apes's pamphlets alongside Jefferson's 1801 appendix to Notes allows us to see how both writers recognized Jefferson's authorial vulnerability as an opportunity to assert their own authority. 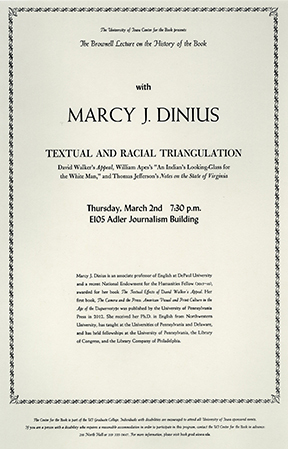 Marcy J. Dinius is an associate professor of English at DePaul University and a recent National Endowment for the Humanities Fellow (2015-16), awarded for her book The Textual Effects of David Walker's Appeal. Her first book, The Camera and The Press: American Visual and Print Culture in the Age of the Daguerreotype was published by the University of Pennsylvania Press in 2012. She received her Ph.D. in English from Northwestern University, has taught at the Universities of Pennsylvania and Delaware, and has held fellowships at the University of Pennsylvania, the Library of Congress, and the Library Company of Philadelphia.